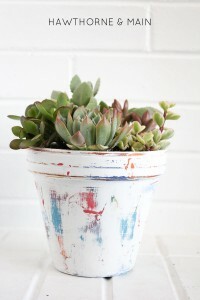 I am a huge fan of all the rustic home decor that has been floating around Pinterest lately!! I am honestly….truthfully….still trying to figure out my style…. Is it ok to like boho, chic, fancy, and modern all at the same time and actually have it look good!!!? I originally got my inspiration for these pillows over here, aren’t they just lovely!! 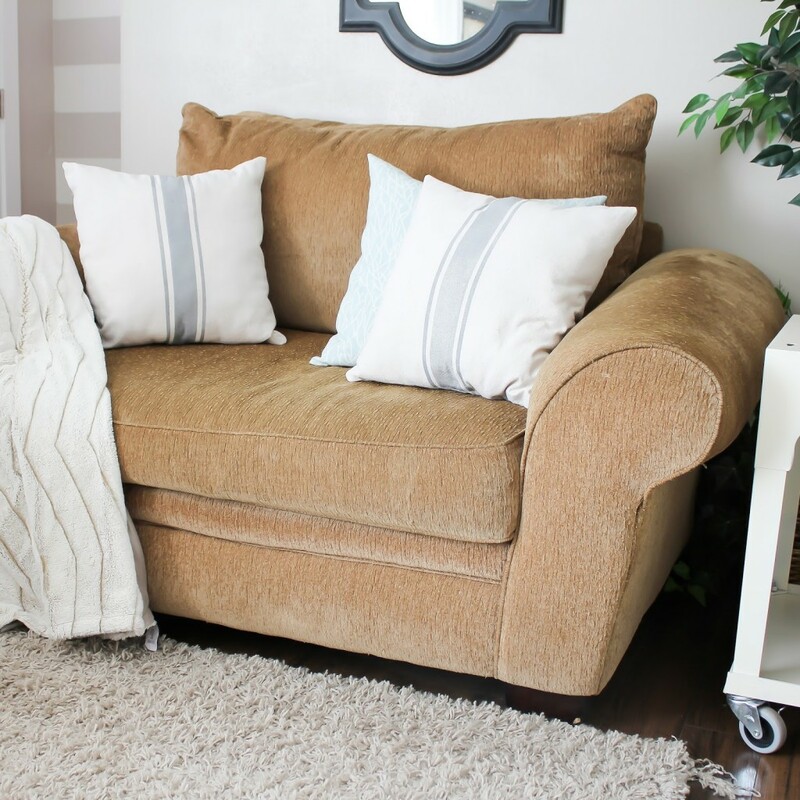 These pillows came together real quick so grab your sewing machine and lets get sewing!!! I found this spray paint at Joann. I had never heard of it before this project, but I love it!! 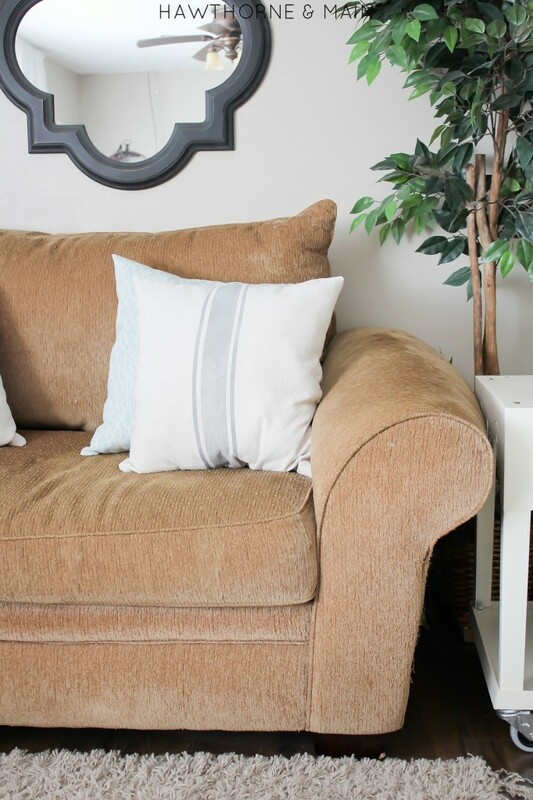 We have been using these pillows in our living room, the room that gets all the use, and I can say that this paint really has held up well. They haven’t shown any signs of wear and the fabric is very pliable it almost fells factory made. I made these about 2 months ago! Please wash and dry your drop cloth before you begin. This will prevent any possible shrinking later on. I love this fabric because it is cheap and the color is great. To start, cut two square pieces of drop cloth, one for the front and one for the back. I made mine 20 inches by 20 inches. Then, using the painters tape mark off a section in the middle of the fabric that is about 1.5-2.0 inches wide. See image 2 below. 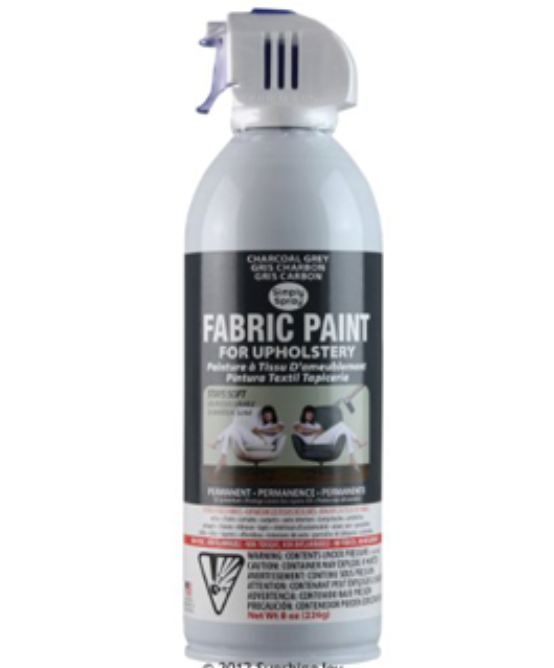 Take it outside and gently spray a light coat of the fabric paint. Be sure to mask off the portion of the pillow that you don’t want to get any paint on. This is spray paint so there will be some over spray. I just laid out some news papers over the top. See image 3 below. 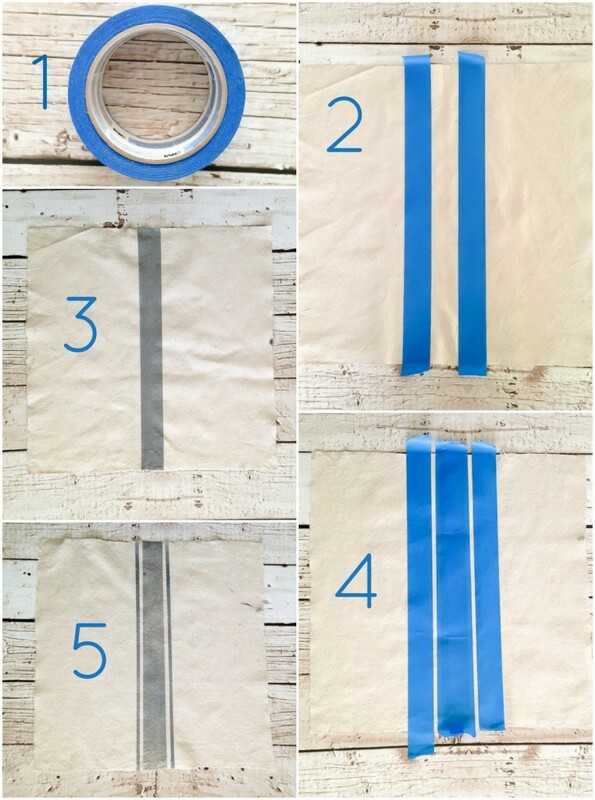 After the first stripe is done, and the paint is dry, use the making tape to make the two smaller outer lines. See below in picture 4. Again mask off the areas you don’t want any paint on. 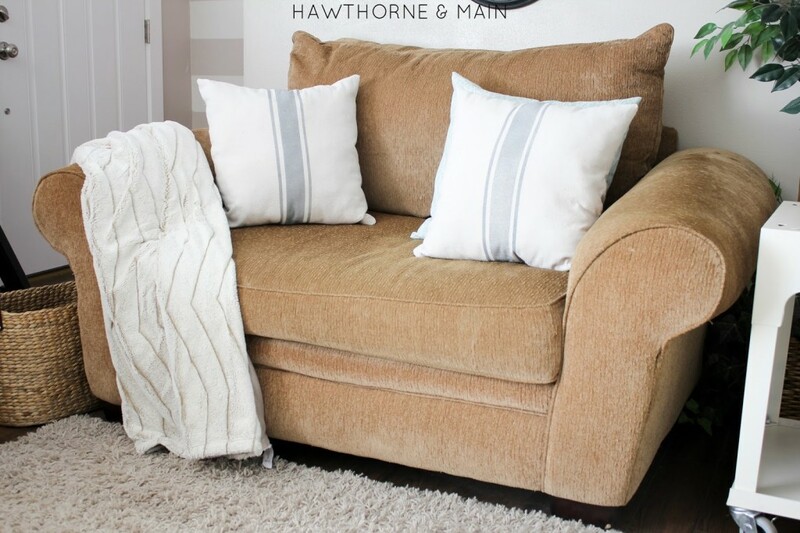 To sew these pillows, put right sides facing and sew all the way around leaving one small section open, it only needs to be as big as your fist. 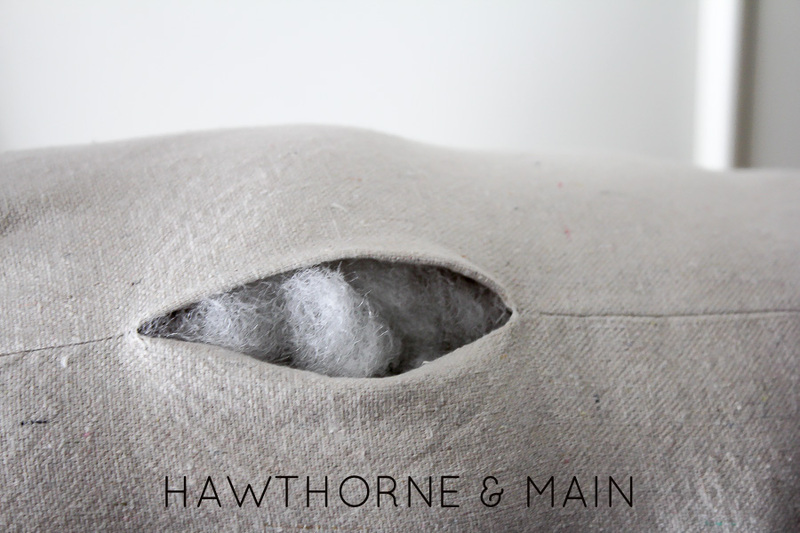 After you are done sewing turn the entire pillow right side out. 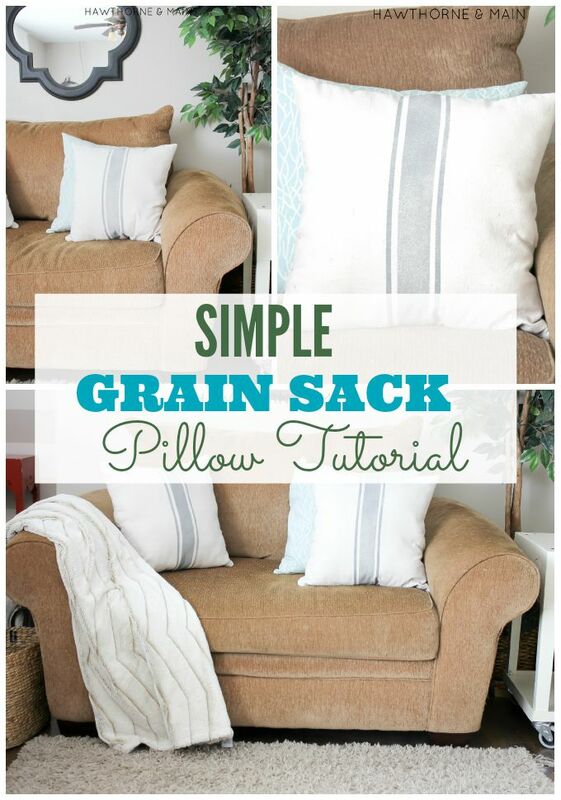 Use the poly fill to stuff the pillow. After it is filled to your liking, use a needle and tread to hand sew the small opening shut. Done. If you are super handy you could add a zipper! I love how these turned out. I cannot wait to see what else I can paint with this awesome fabric spray paint. I love this new paint!! What would you paint with it!? Such a great idea!! The real ones are sooooo pricey! These one fit a budget for sure! 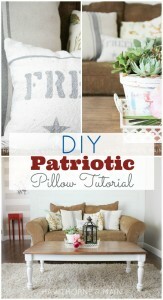 We still use these pillows and they looks just as good now as they did the day I made them. Love them! Thanks Wendy! I love these! Such a simple idea that adds so much style! Thanks for sharing at Merry Monday this week. I’ve been wanting to make these. Love how these turned out. Thanks for sharing at Work it Wednesday! Love when I keep stumbling on the same blog! This is exactly what I’ve been looking for, for my new bedding! Awesome Lara, thanks for stopping by! These are great pillows. I am actually using one right now! haha Have a great weekend. Thanks Sarah! I love how easy this one was to make. Its always nice to save some money!! Have a great weekend.